The city of Aleppo is suffering. Over the last six weeks, the eastern part of Syria’s largest city has undergone the worst bombardment in six years of war. Even hospitals and aid convoys have been targeted. Hundreds have lost their lives, and the ferocity of the bombing has left large areas of the city without vital supplies and services. The United Nations estimates that over 275,000 people are now besieged, with no end in sight. 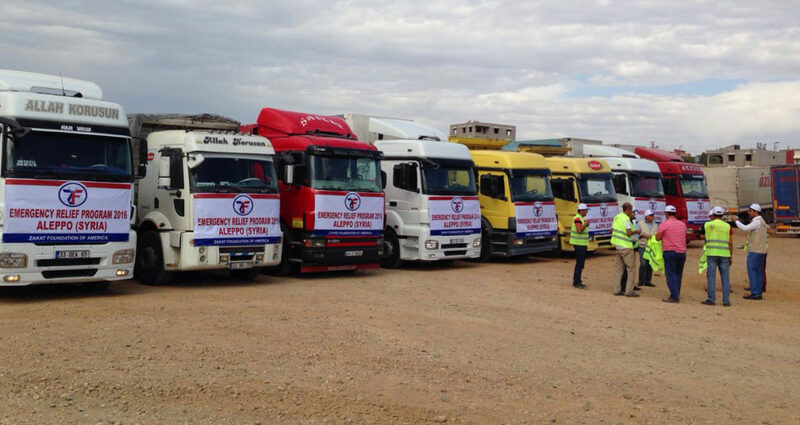 Zakat Foundation of America is mobilizing to help the Syrian people in their time of need by sending cargo trucks full of food packages containing rice, potatoes, cooking oil, and macaroni. These trucks will unload supplies some comfort and stability amid the chaos of the war. Please support our relief effort and help Aleppo live by donating a food package today for $60.